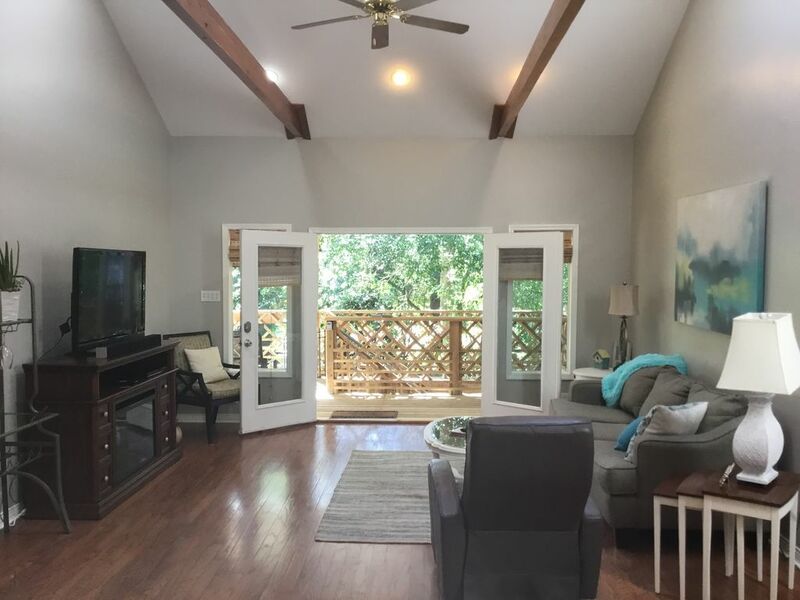 Welcome everyone to our relaxing cottage in the heart of Old Mandeville. You will love it and not want to leave. Our cottage is only steps away from Mandeville’s Beautiful Lakefront which is perfect to take a leisure walk, jog, ride bikes or just sit and enjoy the views and sunsets. There are children’s playgrounds on both ends and a splash pad at the end near the cottage. The city boat launch is across the street at the harbor for those who want to bring a boat, or book a fishing trip with Wicked Fishing Charters that leaves from the launch. They also offer sunset cruises and kayak rentals. We have two bicycles for our guest to use. Upon request we would be happy to bring two extra bikes because the Tammany Trace Bike Trail is right down the street. It is originally a corridor for the Illinois Central Railroad. It is Louisiana’s first rail-trail. The bike path runs from Downtown Covington to Slidell. Old Mandeville offers great restaurants, pubs, gift shops, Saturday outdoor markets, churches and so much more, all within walking and biking distance. New Orleans' French Quarter, Audubon Zoo, Aquariums of the America, The Nation WWII Museum, even Jazz Fest and Mardi Gras are less then 45 minutes away! Just want to get away and have a relaxing time? There is no better place than on the large porch where a nice breeze blows from the lake. Enjoy your coffee in the morning and drinks in the evening. Of course, this is our Favorite place! We enjoy vacationing in quaint little towns with our friends. So we decided to buy a house in our home town. We can't wait for you to visit us. There is no place like Old Mandeville. Both bathrooms are spa bathrooms with a jacuzzi bath tub and a separate shower. It is cozy and warm in the den with an electric fireplace. Covered parking available under the house. Upon request we have 2 more. Fantastic relaxing porch with access from both bedrooms and living area. Mandeville is a wonderful place to be or just 45 minutes away from all the activities in New Orleans and an hour away from Baton Rouge and the Mississippi coast. Owner Susan is a delight to work with . She's positive and caring. The home is beautiful and had everything we needed. In a wonderful location, the home is near restaurants and the bike path. Trees surround a few private homes on this extended driveway...quiet and peaceful but only a few blocks from activity. A must stay if you are in Mandeville! Wonderful rental. Lots of room for everyone. Everything you would need for an extended stay is there. Great location. The bikes are a nice touch so you can explore all Old Mandeville has to offer. Very well appointed. Perfect for 2 couples or a small family. Susan is the perfect host, always looking after any needs you may have. We would highly recommend this rental. Great place to stay. Clean, quiet, and great hosts. We had a great time at the Old Mandeville Cottage. It is quiet and close to Lake Pontchartrain and restaurants. You can almost walk to any where you want to go if you enjoy walking. It was clean and very comfortable. Hosts are very helpful and friendly. Stayed here for a weekend and it was a very nice place. Would definitely stay here again, referably spring or fall to take advantage of the parks and biking. Good communication from owner. Very nice property. Very clean and comfortable for a relaxing stay. Overall very happy. Everything we needed was there and Susan was very nice and flexible as we needed to add some days on to the trip. Very relaxing environment- would definitely recommend!! The house was clean and comfortable. Great location as well. The owners are very nice and work hard to make the place perfect.